Double Up Food Bucks/SNAP Incentives: At nearly every stop of our tour, it was clear that the Double Up Food Bucks program has made an incredible impact on local communities. Participants were eager to learn more about the program, hear about how much it has grown over its first two years, and to express their support for its continued funding. To sustain and expand this program, LiveWell will pursue state funding in the 2018 legislative session. Colorado Food Systems Advisory Council and Farm-to-School Taskforce: Farm-to-School remains a popular program for both food access advocates and school food professionals. 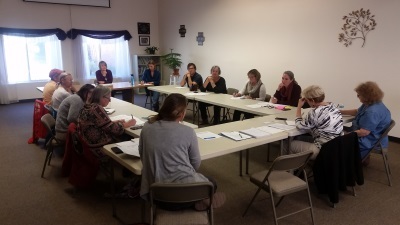 Participants were eager to learn more about a proposal that would assign a staff person to the Colorado Food Systems Advisory Council (COFSAC) and help navigate state and federal regulations to increase the presence of such programs across Colorado. Opioid Crisis: While not relating directly to healthy eating and active living, we heard from many communities about the weight placed on their citizens by the opioid epidemic. It was an important reminder for the policy team that in order to successfully address barriers to health, we must meet communities where they are and consider all of the factors contributing to their wellbeing. Food Regulations: We encountered a number of producers confused by the web of federal and state regulations regarding food safety, especially in the context of getting local food into schools. Many felt that current rules served to exclude small and medium producers from selling to their local school districts, or that rules primarily benefitted larger producers. LiveWell is currently performing a basic audit of food regulations in Colorado to better provide assistance to these producers.